An ancient engraving was discovered on Mars that looked similar to the carvings that were found on Earth. It has gotten the social media conspiracy theorists fired up. According to Yahoo News UK, it was spotted in a picture that was captured by the Mars Curiosity Rover and Opportunity Rover. The article mentioned that UFO Sightings Hotspot, on its blog post on October 17, noted that the image captured looked like ancient petroglyphs that were found on Earth long time ago. (Photo: Reuters / NASA/JPL-Caltech/MSSS/Handout) A color mosaic taken by NASA’s Mars Curiosity rover Mast Camera (mastcam) shows strata exposed along the margins of the valleys in the “Pahrump Hills” region on Mars in this undated handout photo courtesy of NASA. After 18 months of driving, scientists on September 11, 2014, announced that Curiosity had arrived at the base of Mount Sharp ahead of schedule, thanks to a somewhat serendipitous decision to take an alternative path that would be gentler on the rover’s damaged wheels. Within two weeks, Curiosity will reach an outcrop of rock called Pahrump Hills, where the first drill samples of Mount Sharp real estate will be made. The blog post mentioned that the petroglyphs looked like human figures and was interesting as they were the same symbols that were found in the Earth in times when people could not have interacted with each other. The discovery has led to many rumours and theories have come up about the existence of alien life. Many other objects have been found on Mars like a statue, a gearwheel and a thighbone, reported News.com.au. It is said that the engraving comes from a rock whose image was captured long ago by the Rover. The rock looked like it was heavily pixelated and marked with scratches as well as indentations. News.com.au reported that with a few red lines, the rock could be interpreted as a part of an engraving, but only if one squints. 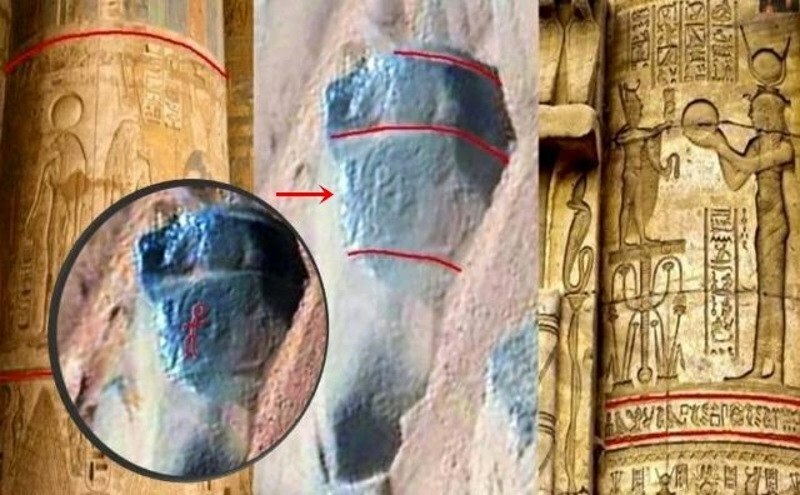 A YouTube user, UFOvni2012, went on to say that the creator of the engraving were “humanoids” because of scratches on it. Three deep engraved liked were noticed on the surface. News.com.au’s report explained that when the brain interprets the input of the eye as something that is familiar to them. It said that it was the reason why people usually see figures in clouds or faces on Mars. The first time that a face was noticed on Mars was by NASA in the late 1970s. The scientists had made fun of the way shadows had made a mountain look like a face. The face on Mars was taken so seriously that many books, blogs and television documentaries were made on it. NASA then cleared the rumours out by saying that it was just rocks with lighting conditions that made it look like a face from a distance.